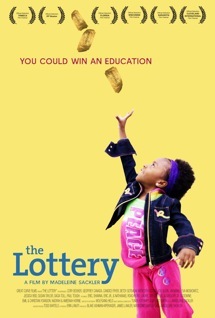 THE LOTTERY is a deeply partisan piece of documentary film-making, advancing the case of publicly funded but privately managed Charter Schools over the old established Zone schools. The argument is advanced with a dazzling array of statistics quoted on screen, calm and dignified talking heads, and seemingly evangelical teachers and parents. The basic thesis is that the monopolistic provision of publicly funded, publicly controlled primary school education in America's deprived inner cities is failing its typically second-generation immigrant and African-American students. Inept teachers are protected from accountability by strident unions and politicians, dependent on the union vote, are reluctant to act. The alternative is the Charter School - schools publicly funded but managed by private sector bodies that stand to lose their charter if they don't achieve results. Charter Schools apparently get those results by Taking Education Seriously - longer school days, longer terms, obligations on parents to read to their kids and make their kids show up. They are championed by eloquent and passionate teachers and politicians who are given ample time in this documentary to state their case for empowering parents and giving children a chance to succeed. And what could be better evidence of the Charter School's success than the fact that so many parents are desperate to get their kids accepted that they subject themselves to an annual lottery for scarce places? It is this lottery - and the journey of four Harlem families through it - that provides the hook for this political film. I have a lot of sympathy with the provision of multiple education choices, and with the idea of ambitious parents wanting to lift their kids out of public education. After all, my parents worked hard to put me through a private prep school and I was a scholarship girl in a private secondary school. If I have kids, and I can afford it, I'll be sending them to the best private school I can afford. So, be assured that what follows is not politically motivated. THE LOTTERY is a very poorly made documentary because it makes no attempt to present a balanced case. Rather it is pure political propaganda. The proponents of Charter Schools are given plenty of time to calmly state their case. They are portrayed as earnest, articulate and rational. Their opponents - the teaching unions - are portrayed as a loud, irrational, selfish rabble, photographed shouting on the streets but not given the same calm talking head format to explain their position. The statistics quoted are also very selective, and there is little attempt to interrogate either the numbers or the people advocating Charter Schools. Nowhere does director Madeleine Sackler point out the political ambitions of the head of the Charter School movement, Eva Moskowitz, for instance. The issue of whether Charter Schools work and how they impact local public schools is absolutely critical, not just in the US, but also in the UK where the new Conservative-Lib-Dem government is keen to introduce them. Unfortunately, THE LOTTERY gives us just one side of the coin, making it of little real use in addressing the issues. If you want to find that balance, you can look at a recent edition of the New York Review of Books. Diane Ravitch reviewed the Davis Guggenheim documentary, WAITING FOR SUPERMAN, which covers similar territory to THE LOTTERY, but garnered more attention, presumably because Guggenheim's previous film, AN INCOVENIENT TRUTH, was so very commercially and critically acclaimed. Ravitch is a Professor of Education at NYU and a Brookings Institution fellow, and her more nuanced and balanced assessment of the successes and failures of Charter Schools relative to Zone schools can be found here. THE LOTTERY played a bunch of festivals including Tribeca and went on limited release in the US in May 2010.